The 2015 Michelin Guide is officially available for all San Francisco Bay Area foodies to savor. Whether you’re a local or a recent transplant, finding a great place to eat is at the tip of your fingers with the 2015 MICHELIN Guide San Francisco Bay Area & Wine Country. October is always an exciting month. For some it is the beautiful weather, for others it is the pumpkin patches at every turn and the promise of Halloween to come or, if we are lucky, the Giants in the World Series. For me on the other hand, October is all about the mid-month announcement by the Michelin Guide naming their top picks for restaurants in our area! With meticulous care in the research and objective recommendations to more than 500 restaurants, representing more than 40 different cuisines, the restaurants in the 2015 MICHELIN Guide will make your mouth water. Local, anonymous and professional inspectors use the renowned Michelin food star-rating system to curate restaurant selections for the 2015 MICHELIN Guide; for me, and other diners in the know, it is a “go-to” resource. 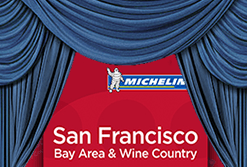 The 2015 Michelin Guide to San Francisco Bay Area dining, was announced at the Michelin Guide 2015 Star Gala last night (October 21, 2014) in San Francisco. Those fortunate enough to be in attendance enjoyed tasting menus by chefs from the star-earning restaurants and conversations amidst the Who’s Who of San Francisco’s culinary elite. The Banking Hall of the Bently Reserve played host to this exquisite evening as the best in Bay Area food was served in elegant harmony with wine from Napa Valley Vintners, Champagne Laurent-Perrier and hand-crafted cocktails. The 2015 Michelin Guide has already created quite the buzz in the restaurant world with Corey Lee’s four-year-old Benu, and Joshua Skenes’ Saison emerging as the stars, or three stars as it were. This is up from their earlier two-star designations. While Corey Lee (of Benu in San Francisco) and Joshua Skenes (of Saison in San Francisco) are French-trained, the strong Asian influences in their dishes make it possible for them to realize a unique combination that makes one’s taste buds take notice. With their new three-star distinction they have a seat at the table with the Bay Area’s other three-star restaurants: the French Laundry (Yountville) and the Restaurant at Meadowood (St. Helena), the only other two hot-spots since 2011. And then there’s Acquerello, now able to celebrate more than their 25th Anniversary. Chef and owner Suzette Gresham joins Dominique Crenn of Atelier Crenn in San Francisco, and Emma Bengtsson of Aquavit in New York, as one of just three female chefs in the United States with two stars. Two new restaurants join the one-star ranks in the 2015 Michelin Guide, both sushi restaurants in San Francisco: Kusakabe and Maruya. They join 28 other restaurants sharing this distinction from Cupertino to Healdsburg. Excited to see them there! Manresa remains at two stars – Despite a fire that caused it to close in July, and in the face of much internal debate about whether to include it, they were at last given the benefit of the doubt thanks in every respect to chef-owner David Kinch’s regular updates regarding their much-anticipated re-launch and Manresa’s impressive history. Starting prices for the creme de la creme remain in the $200-300 range – French Laundry $295 – Saison $248 – Restaurant at Meadowood $225 – Benu $195 – Starting cost-points to consider. No “falling stars” remains the best news of all – One of the biggest surprises in the 2015 Michelin Guide is that no restaurant is a star down! No restaurant lost a star from last year and we love that! The San Francisco Bay Area is indeed a wondrous culinary constellation on the rise! 2015 Three Michelin Stars– Exceptional Cuisine. Three stars, the highest rating, is given in recognition of exceptional cuisine. It identifies restaurants where diners are met with distinctive dishes, precisely executed with the utmost in fresh, distinguishing ingredients. Michelin Three Star establishments are destinations in and of themselves. Photo Credit – Thank you to the Michelin Guide for the use of their photo of the 2015 San Francisco & Wine Country Restaurant Guide.